An exchange rate of almost 1:1 between the Swiss franc and the euro, coupled with VAT reimbursement, again proved to be very attractive for Swiss shopping tourists in 2016. In the previous year they were willing to accept long-distance routes to buy from theirneighbors along the Swiss border - a total of nearby EUR 9.2 billion. 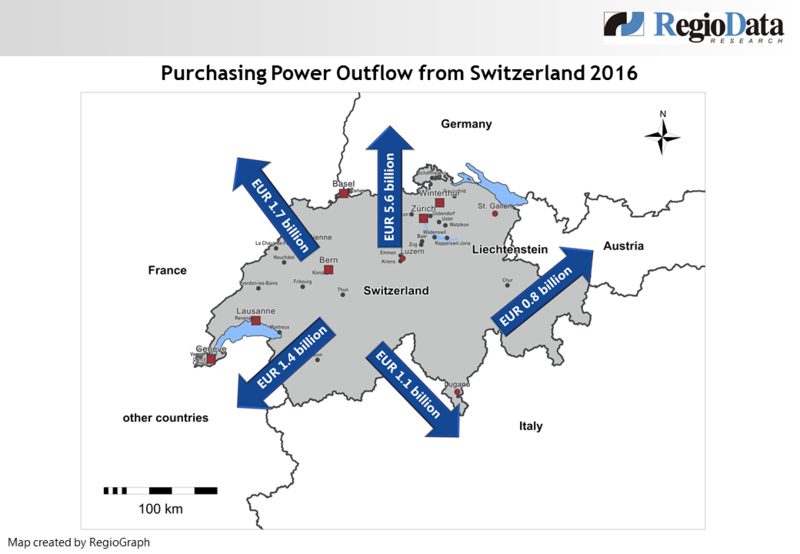 This is more than one-tenth of the entire Swiss retail market. The largest cash-outflows exist in the food, clothing and footwear industry, whereby the latter causes additional headaches because of the online purchases. Due to the repealed regulation of the €/CHF lower limit at the beginning of 2015, the Franc appreciated 15 % during the year, then stabilizing between CHF 1.05 and CHF 1.10. As a consequence cross-border shopping rose sharply to the previous years - mainly to Germany, which is the most important region for Swiss shopping tourism. In total (all countries) the value of foreign purchases (excluding purchases in foreign online shops) can be estimated at around EUR 10.6 billion. As an economic counteraction, opening hours were extended in Switzerland, with the aim of encouraging consumers to purchase domestic goods. In 2017, a stabilization of the exchange rate is to be expected. Due to negative interest rates and foreign currency purchases by the Swiss National Bank the exchange rate will level off at CHF 1.10. Shopping tourism is predicted to stabilize on the level of 2016. However, the moderately good consumer mood is not expected to get much better in 2017. After gross wages have risen markedly above the expected inflation or deflation rate, the demand for 2017 should improve considerably, but also mainly as a result of net immigration. Under the given circumstances the situation of the retail trade should ease again, and an increase in turnover should be possible.